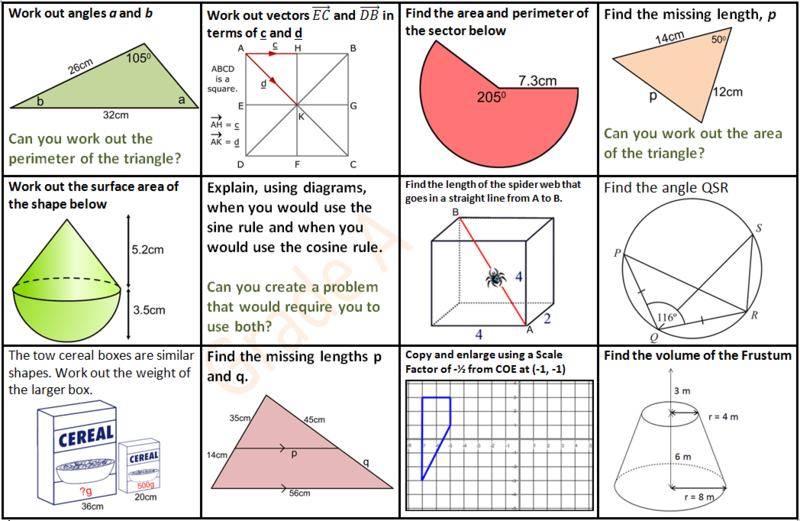 I’ve uploaded one example of such a booklet, used with a bottom set Y7 class, on TES here. Of course, it doesn’t have to be printed out as a booklet – projecting it also works. Either way, I’d recommend making them using random number generators in Excel, so you have an infinite variety of suitable questions, ready to project at a moment’s notice. And once you’ve gotten the hang of using Excel, and the pupils have gotten the hang of these questions, it’s really easy to increase or decrease the complexity of your question set. Other topics we’ve made booklets for include lots of practice with operations with negatives, decimal multiplication, and fraction operations. Or really, whenever you stumble upon a topic that your pupils keep on forgetting, just make a starter booklet! Give them 5 minutes of practice every lesson for a term, and complain no more. The spacing effect is one of the strongest effects in memory research. Yet we don’t use it nearly enough. Our failure to make more of it is at the heart of much of the performance-learning gap: pupils can follow what we tell them to do in a lesson, but because we fail to revisit and re-practice over time, pupils’ lesson performance doesn’t turn into learning that endures in the long or even medium term. As I realised at the end of my first half-term as a teacher, this is disastrous for our pupils’ maths attainment, and thus their mathematical confidence and competency. An excellent blog! I wonder if this also works when teaching English? This is a great post and I wish more maths was taught this way, and more schemes of work were drawn up with spacing in mind. I feel that the “spiral” curriculum is rarely twisted tight enough, and too long is left before topics are touched again. But a doubt nags: while we can “get away with it” with for higher sets or higher-level qualifications, does that mean we *should*? Could we deepen understanding, build long-term memory, and boost attainment by applying spacing techniques elsewhere? Is there evidence that they would still be as effective? Even university students struggle to retain knowledge as they work through their degree, as was discussed under your previous post, so this is by no means a problem limited to KS3 and KS4 lower sets. Every A-level teacher knows that sinking feeling when you mark the half-term test on the last three chapters of the book, to find that even the basic recall questions from the first two of those chapters have slipped beyond the realm of human capability. If you’re busy teaching differentiation rules, you aren’t recapping trig identities. That is unless you make a conscious effort to slip in regular recall tests (which is what I tried to do), but in principle I can see no reason you couldn’t interleave the topics more thoroughly rather than teach them in blocks in the first place. What stops us teaching the reciprocal and Pythagorean trig identities at the start of a lesson, and quotient rule in the second half? You could even tie two threads together by finishing off with how to differentiate cosec x = 1/sin x, but I don’t think scheduling needs to built around seeking such synergies. If you design your scheme of work with chapters running in parallel, you could go the whole half-term without letting either topic rest unattended. I’ve never seen this tried, but I’d love to know how well it could be made work. As A-level becomes non-modular and you need to keep the material ticking over for two years, it seems to me that spacing and other memory research are more vital than ever. I’m a piano teacher in the U.S. who found my way to your blog via the Learning Scientists. There are so many parallels between your math curriculum and the best way to teach music! As I read, I found myself comparing your descriptions to my own lesson plans and long-term goals for students. I was tickled to read your conclusion and I whole-heartedly agree! However, most piano teachers don’t create lesson plans or plan long-term for their students. Many do expect beginners to learn 1 – 3 new pieces every week. They teach repertoire only and never think about breaking pieces down into the constituent concepts & skills. “Talented” students do okay with this type of teaching, but average students flounder (and quit). This bothered me when I started teaching. Why can’t I teach in a way that helps everyone succeed? Like you, I have found that if I prepare students by teaching the concepts & skills in advance over several weeks, a little bit at a time, all of my students are successful. I can see how this is better than a topic based approach. However, I’m still not sure how kids who already have the skills covered are moving forward? Surely there are some students in your classes for which these tasks don’t stretch them? And surely there are some for whom this isn’t a challenge at all? Or do you just stream classes? Two responses: I believe in streaming, so that eliminates some of the problem. Secondly, your question is still valid in this context. Several responses come to mind. Firstly, I think we overestimate the degree to which students have mastered the skills we teach them – the learning / performance distinction comes in handy here, as does the concept of overlearning. I think a huge downside of the narrative of ‘moving forward’ and ‘all groups of learners making progress’ is that it doesn’t recognize the importance of overlearning. A quote I really like is: ‘don’t practise until you get it right, practise until you can’t get it wrong’. How often do we really give pupils the chance to master a skill to that extent? Secondly, that said, sometimes there are some skills which pupils have truly mastered. This is often the case for the drills I posted on TES, linked in my blog. Since the focus with those skills is getting them to automaticity, those same pupils will often be the fastest at completing a drill, after which I will put up a nice challenge question for them to do whilst everyone else is finishing off the drill. I’ll often reward speed and accuracy with merits and praise, too, to emphasise the importance of overlearning and mastery – this means that the kids are motivated to get even better in terms of speed, and still enjoy the drill, even though they feel pretty confident with the topic. Hope that helps. This blog post has really inspired me. Thank you. I used this idea of spacing and trying to fit 4 or 5 topics into every lesson a couple of years ago with a low ability year 11 class. It was successful but I haven’t repeated it with other low ability groups from other year groups and I think the reason is partly the amount of work required to pull it off. However, I am going to be teaching a low ability year 7 class next year (possibly 2) and think that the connecting maths concepts books look perfect. The problem is that getting the books is proving tough. I have a couple of questions I am hoping you can answer. 1. What books/level would you recommend starting with? Thanks for the kind comments. I haven’t ordered them myself, so the best person to ask might be my HoD! dquinn at mcsbrent dot co dot uk. It’s worth knowing too: the connecting maths books are great but expensive, and come with a workbook that can only be used once. At Michaela we only use it with our intervention group – the absolute weakest 10 pupils in the entire year. So it’s hard for me to recommend what level to start with! I’d recommend a really careful preview through as much of it as possible – I haven’t tried using it in a whole class setting and I can foresee some difficulties that there might be in that case. That said, it was designed as a whole class resource too! The sad thing, as you say, is that there is no alternative that employs spacing to quite the degree that it does – as you say, it’s a huge amount of work to design. Hope that’s helpful! Absolutely fascinating stuff. I am going to try a variation of this with my weaker Y5 group. How do you think it would work if I taught the entire group the whole concept, but then with the weaker group, only gave them a certain number of questions on that concept? The rest of the questions would be a range of topics in which they struggle?